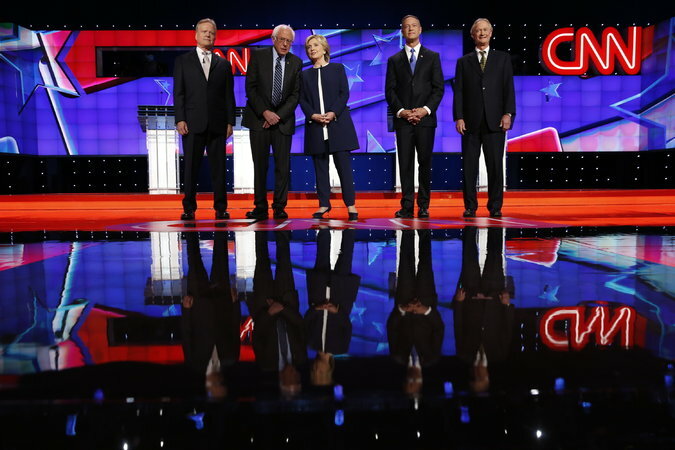 The first Democratic debate took place in Las Vegas Tuesday night where the Democratic candidates running for president gathered to face off. “On this stage, you didn’t hear anyone denigrate women, you didn’t hear anyone make racist comments about new American immigrants. You didn’t hear anyone speak ill of another American because of their religious beliefs. What you heard was an honest search for the answers that will move our country forward,” as said in Governor O’Malley’s closing statement. O’Malley’s statement was met with thunderous applause, echoing the sentiments of Republicans and Democrats alike, disenfranchised by Trump and his supporters. It was a moment of brilliance within his otherwise ordinary performance. When the six candidates arrived in Las Vegas, they likely had an inkling of how the night would unfold. Despite repeated calls for equal airtime, the debate largely came down to a battle between frontrunner Hillary Clinton and dark horse Bernie Sanders. The three other political veterans, Martin O’Malley, Lincoln Chafee, and Jim Webb, were lost in the fray. In fact, the tone of the debate closely followed that of the opening questions. Clinton was cool and composed, though her answers lacked substance. Sanders seemed harried, stumbling over himself, but offered passionate and meaningful responses. In comparison, the other three candidates were given less attention. When all was said and done, despite her shortcomings, the pundits crowned Hillary winner of the debate, citing her experience on the stage and campaign trail. On Sanders, they were less sure—though he did little to broaden his base, he made no gaffes and stuck true to his principals. The other three (Chafee, O’Malley, and Webb), were declared solid losers, who did little to distinguish themselves upon the stage. Who will be the winner in the long run? Only time can tell. Sanders certainly did not lose momentum, but rather, failed to gain any. Though a loss in itself, it is not one he cannot overcome. If he repackages his message in a way that does not seem repetitive and tired, and manages to make his platform of democratic socialism digestible to the general public, then he has a solid chance of winning the nomination. As it stands, however, Hillary is the safe choice—as a political moderate with excellent debating skills and years of experience, she has earned herself the title of “favorite,” and will likely retain it for the foreseeable future.